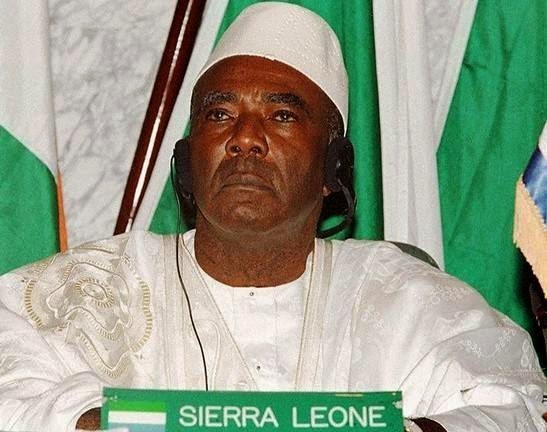 Sierra Leoneans around the world are mourning their former president, Ahmad Tejan-Kabbah, who died on Thursday, March 13, 2014. Kabbah marked his 82nd birthday on February 16. Family sources say he passed away peacefully after a long illness at 4p.m in Freetown with family members at his side. Kabbah was an economist and attorney. He retired from the United Nations in the early 1990s after spending many years working for the UN Development Program. He returned to Sierra Leone in 1992. In early 1996, Kabbah was elected leader of the Sierra Leone People's Party (SLPP) and the party's presidential candidate in the 1996 presidential election. He was elected president of Sierra Leone in the 1996 presidential election with 59 percent of the vote defeating his closest rival John Karefa-Smart of the United National People's Party who had 40 percent in the runoff vote and conceded defeat. Led by Nigeria, the Economic Community of West African States (ECOWAS), returned Kabbah to power after a military intervention. As president, Kabbah signed several peace accords with Foday Sankoh, including the 1999 Lomé Peace Accord, in which the rebels agreed to a temporary cease-fire with the Sierra Leone government. When the agreement with the rebels collapsed, Kabbah campaigned for international assistance from the British, the United Nations Security Council, the African Union and the Economic Community of West African States to help defeat the rebels and restored peace and order in Sierra Leone. In his inauguration speech in Freetown, Kabbah promised to end the civil war, which he indeed achieved later in his presidency. But most of Kabbah's time in office was influenced by war with the Revolutionary United Front, led by Foday Sankoh, which involved Kabbah being temporarily ousted from May 1997 to March 1998 by the Armed Forces Revolutionary Council. Kabbah declared the civil war officially over in early 2002. Tens of thousands of Sierra Leoneans across the country took to the streets in celebrating the end of the war. Kabbah went on to easily win his final five-year term in office in the presidential election later that year with 70.1 percent of the vote, defeating his main opponent Ernest Bai Koroma of the main opposition All People's Congress (APC). 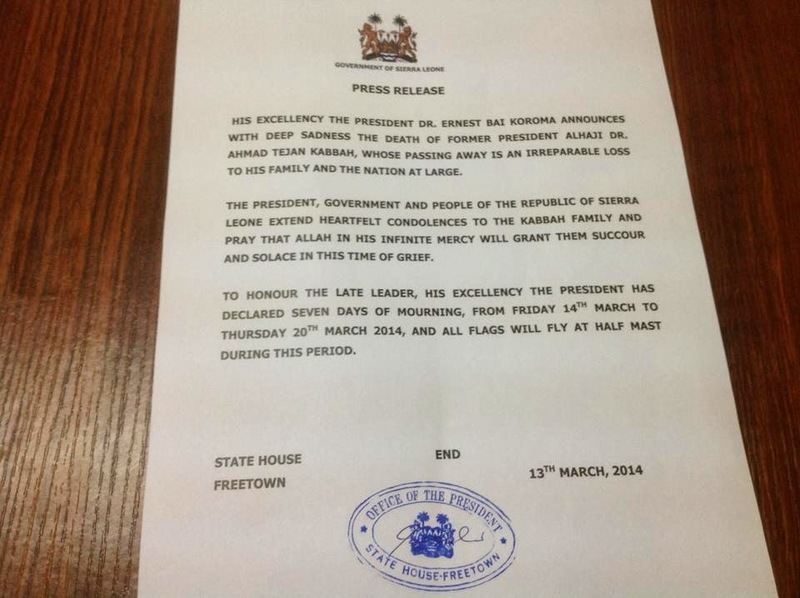 After completing two terms in office, Kabbah handed over power to President Ernest Bai Koroma in 2007. Kabbah spent a few years in active service as an international Statesman, leading elections observation missions and giving international lectures, an Awareness Times editorial states. However, in the last two years, ill health made him reduce his public appearances. His death has been greeted with a lot of sadness, exemplifying the respect and love he commanded from his people, the paper wrote. The death of former President AL haji Ahmad Tejan-Kabbah is an irreparable loss to his family and the nation at large,” State House said.